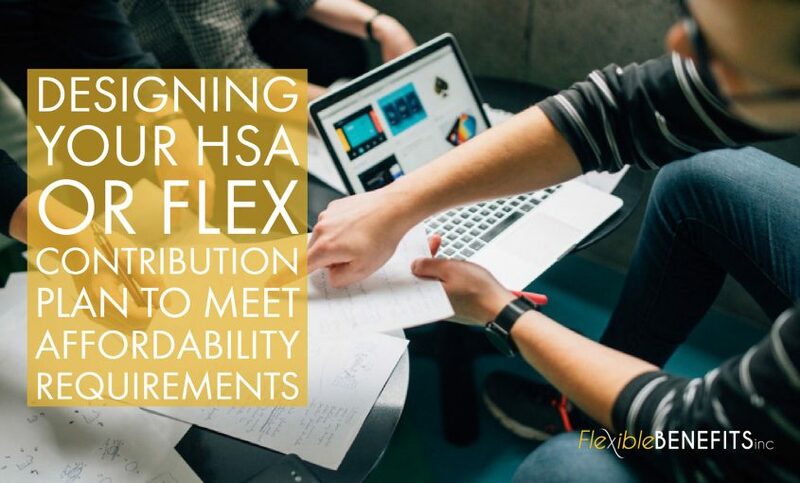 DESIGNING YOUR HSA OR FLEX CONTRIBUTION PLAN TO MEET AFFORDABILITY REQUIREMENTS – Flexible Benefits Inc. When choosing your healthcare coverage, you may be overwhelmed by the options. The best thing to do is to review what you have that can be used to your advantage, in layman’s terms. Our experts are here to break down how you can utilize a Health Savings Account, or Flex Contribution Plan while still meeting affordability requirements. A health savings account (HSA) is similar to a savings account which any taxpayer in the United States can access if they choose the high-deductible version of their health plan. The person in charge of the health insurance plan, whether that’s you for your singular health, or for your entire family will manage the contributions to this annual account. Everything contributed is free from federal income tax. Funds roll over and accumulate year to year in HSA accounts. Secondly, what are the affordability requirements associated with HSA and Flex Contribution accounts? You may only contribute $2,650 per year, unless you are married, in which your spouse can also input $2,650. You can use your account to pay for a variety of healthcare products and services for you, your spouse, and your dependents. The IRS determines which expenses are eligible for reimbursement. Generally, eligible expenses include items that are meant to diagnose, cure, mitigate, treat, or prevent illness or disease. This also includes transportation for medical care. However, expenses such as cosmetic surgery, insurance premiums, vitamins, and items for general well-being are not eligible expenses. FSA often covers medical items like crutches, thermometers and bandages. Medical FSA’s are pre-funded by the employer, which means that regardless of the amount you set aside each pay period, the entire total of your annual contributions is available for use immediately. This account can only be used if you have a High Deductible Health Plan – the IRS defines this as approximately $13,300 cost of health insurance for a family, and approximately $6,550 for an individual. If you have any questions regarding HSA’s or Flex Contribution Plans, Flexible Benefits, Inc. is here to answer them. Give us a call today, and let us show you what using this great benefit can do for you and your staff. Contact us at (251) 237-1115 or toll-free at 1-888-821-9007.